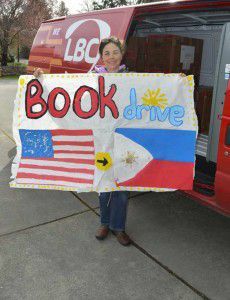 Struck by the impoverished conditions while volunteering at an elementary school in the Philippines in 2010, a Washington woman has taken action: with the help of her community, she has gathered over 12,000 books in the last year. Now, she’s headed back to the Philippines – to build a library. On June 20th, Kimrick Soltanzadeh and her children will fly to the rural village, which is just outside of the island’s capital, Bacolod City. There they will watch the schoolkids open their books for the first time, and set up the space earmarked to be the school’s dedicated library. In preparation, Soltanzadeh is taking a class on library science through the Peace Corps, and she’s spent time consulting with local librarians as well.